Here’s the family of Peping Cojuangco in one spot. 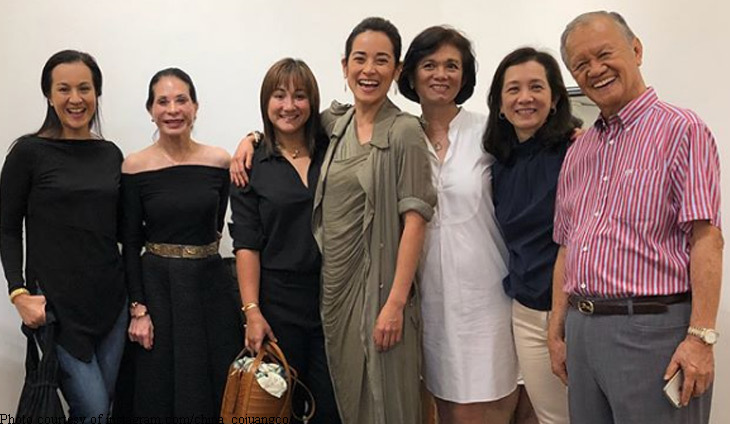 Looking good in their rare family photo are his wife-socialite-philantrophist Tingting and their gorgeous daughters Lia, Josephine, Mikee, Mai-Mai and China. They gathered together for the launch of Mai Mai’s newest collection of handbags under her label Demetria. Well done! More classy stylish handbags to come, Mai Mai. The celebrity chef daughter of Tingting and Peping Cojuangco is one supportive sister. When traveling, it's always fun to do what the locals do. The youngest daughter of Peping and Tingting Cojuangco has Pinoy cravings!